I don’t really know many men who wear odd trousers. Most men have a wardrobe of suits and denim: the former is the anchor for the working week, the latter the weekend default. However, any moves to expand beyond this can often leave many stumped as to the most suitable options. “What the hell is an odd trouser anyway?” you might ask. Simply, odd means to stand alone. The theory of sartorial oddness is aligned with individuality. Odd jackets need to be worn on their own without appearing that they need to be worn with matching trousers. Very fine wool suit jackets, for example, are not suitable as they look as though they have been forcibly separated from their lower halves. Tweed suit jackets on the other hand don’t look out of place as they are naturally less formal and are therefore expected to be worn as separates – particularly when they are distinctly different to the colour and material of the trousers they are worn with. Similarly, odd trousers require distinctive qualities and these qualities are best achieved through a combination of colour and texture. Number one on any list of odd trousers, grey flannels were the uniform of the marvelous Fred Astaire. So connected was he to this material that Audrey Hepburn gave him a picture frame lined in the same grey flannel of his trousers. A solid, mid or heavy weight is best. Grey flannels are very versatile and can be worn with casual corduroy and tweed jackets for countryside informality or navy hopsack blazers for a working week Friday ensemble. For spring and summer there is no better trouser than a light grey, lightweight wool. Again, the flexibility of grey’s beautiful neutrality means they can be worn with practically anything – and to anything. Worn with a silver grenadine tie, blue summer blazer and sockless tassel loafers for a slick, summer formal ensemble; or, with a white polo shirt and white plimsolls to a casual picnic. Wear slightly shorter, and tapered at the ankle. White trousers don’t sound like the most practical suggestion, but there are few better options when the occasion calls for crisp chicness. When the sun comes out, there are few more pleasurable things to wear than a cool pair of cream cotton drills; you feel at once sporty and elegant, slightly retro and yet also timeless. Wear with burgundy penny loafers, blue linen jackets, unlined summer blazers in grey and navy and cosy cricket jumpers for cool summer evenings. Everyone needs a pair of ‘wild’ trousers. The Victorians, before Queen Victoria’s mourning started the fashion for black, were noted for wearing nattily checked trousers, following the fashion for the writings of Sir Walter Scott and Scottish tartan – a trend which the Queen and her husband Albert had also led, due to their love affair with Scotland and acquisition of Balmoral. Tom Ford’s collections have recently revived this look and they are perfect for wearing to break the formality or stiffness of a look. Navy blazers and velvet jackets benefit the most from their playfulness. 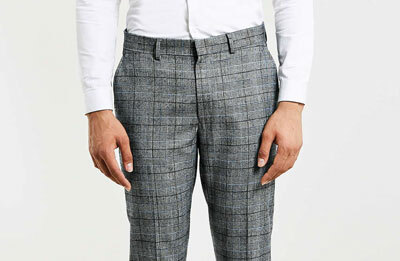 A single pair of odd tweed trousers goes a long way. 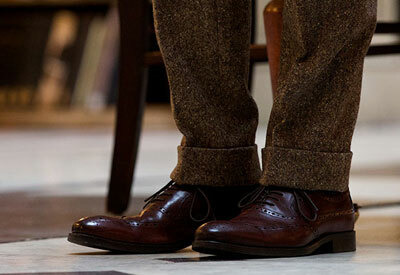 Proper tweed is heavy and hard-wearing, but also elegant. Out of town, when wearing cashmere crew and v-neck sweaters, men utilize few options except denim and corduroy. And yet tweed has far more place on casual weekend jaunts to castles and tea rooms than a pair of jeans. Appropriate for both pub and drawing room, tweed is considerably more flexible, not to mention warmer and more comfortable. A rich brown tweed looks glorious next to smooth navy cashmere sweaters and cardigans, deep green wax jackets and burgundy brogues. I agree with everything you’ve mentioned. Oh, and nice to read you again. Great article. And nice to see you posting again. The grey flannel is a must. 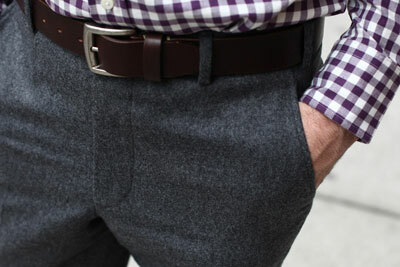 Just as some people wear jeans as their regular type of pants, the grey flannel is a far smarter substitute. Good article. The grey flannels are a nice option.